U.S. News and World Report has named the University of California San Diego the 15th best university in the world, up four spots compared to last year, in the third annual global rankings, released today. The campus was ranked as the 4th best public university in the U.S. on the list of the world’s top 1,000 colleges. The rankings measure factors such as research, global and regional reputation, international collaboration as well as number of highly-cited papers and doctorates awarded. 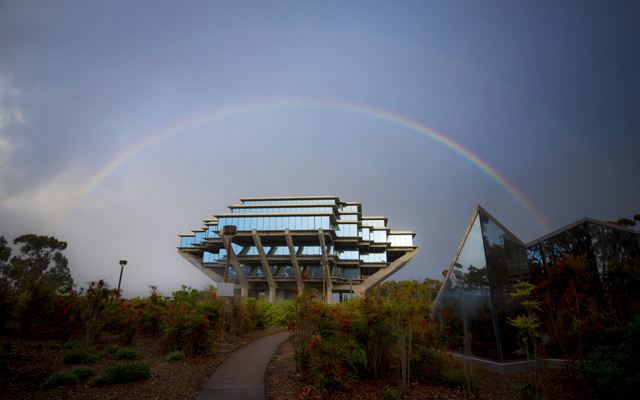 UC San Diego continues to grow its world influence. Earlier this week, the campus announced that the India-based philanthropic organization Tata Trusts has committed $70 million to UC San Diego to establish the Tata Institute for Active Genetics and Society. With the goal of finding solutions to address some of the world’s most pressing challenges, the institute will use a radically new method of gene editing called active genetics to fight insect-borne diseases, make crops more resistant to drought and create better antibiotics. The U.S. News Best Global Universities 2017 edition also features 22 subject rankings, in which UC San Diego received high marks for its academic areas, such as pharmacology and toxicology (5), neuroscience and behavior (6), biology and biochemistry (8), psychiatry and psychology (8), as well as molecular biology and genetics (9). Research at UC San Diego goes far beyond the walls of the campus. Geoscientists from Scripps Institution of Oceanography at UC San Diego published their recent discovery of a potentially significant fault that lies along the Salton Sea and is parallel to the San Andreas Fault, which could impact current seismic hazard models in the earthquake-prone Southern California region. Other groundbreaking discoveries include a psychiatry study that found that while the risk for feeling lonely is partially due to genetics, environment plays a bigger role. In addition, literature professor Luis Martin-Cabrera is collecting stories of indigenous people living in South America’s Lithium Triangle to get a better understanding of the human and ecological consequences of lithium extraction. No. 1 public university in the nation, ranked by Washington Monthly based on social mobility, research and civic engagement. 1st in the nation for women graduates in STEM. According to a study by BestColleges.com, UC San Diego’s proportion of STEM female graduates is three times the national average. 2nd in the nation for high numbers of low-income students and graduation rate success by the Washington, D.C.-based Third Way. 29 of UC San Diego’s undergraduate and graduate programs and disciplines hold top ten rankings nationally and globally. For more information on UC San Diego’s rankings, click here.